Following a recent stand up gig I thought I’d share an experience I had dealing with hecklers. I was closing a show, meaning that I was on last which gave me an opportunity to get a feel for the room and watch the other acts. Where possible, when headlining, try to get there early enough to watch the other earlier acts. You can learn so much about the room, the logistics (mic/lighting/stage) and of course the audience. Arriving early helped me enormously. I watched as a heckler continually interjected mistaking the show for a 2 way conversation. Unfortunately, he was seated right next to the stage and worse, to the side where the performer least directed their attention. The stage was in an odd position meaning that 90% of the audience was to the left unlike the heckler tucked in to the right. The heckler’s location meant that much of what he called out could only be heard by the comedian and a few others. This is the most frustrating fact. It’s better if a heckler can be heard by everyone because then the whole audience is affected and supports your predicament. When you continually stop due to a disturbance only you can hear then you need to either ignore it and move on or spend time explaining what’s happening to the audience up the back. Throughout the night, the heckler was dealt with by the earlier acts to varying degrees of success. At one point the heckler calmed down only to be replaced by another at the same table. I watched this knowing that I was still to perform in over 30 minutes time – plenty of time for the audience to smash down a few more beverages and completely lose the plot. What was going to happen? This was a footy club gig and the audience were all friends. Would they all turn on me as one? Through experience I knew I had something in my favour – a 20 minute break. 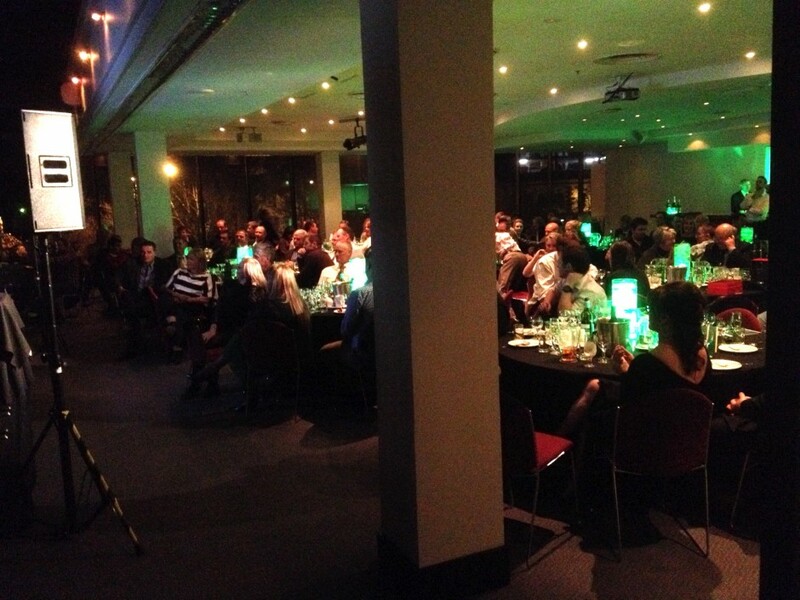 After the 2nd bracket the audience were scheduled to have a dinner break. It was to be very informal though with people milling around the room chatting. This was my chance to quickly and easily negate the hecklers’ power. I simply went up to the two hecklers at the bar and introduced myself as the final comedian of the night. I asked them their names and then I peppered them with the least alpha male questions possible: “Do you have children at the football club?” “How old are your kids?” “What are you raising funds for?” After a few minutes they dropped their macho crap and I was their best friend. At this point I’ve also removed their anonymity. I now knew them and they knew me. I released a pressure valve allowing them to chat to me now rather than later. A few minutes later I started my 30 minute set. I began with a quick reference to each of them by name. I didn’t look at them while doing this, I simply included them in my opening and moved on. Something like “I was chatting with Brian and Mick at the bar and they told me…” etc) Not only did this empower the hecklers in a positive way but it also showed the rest of the crowd that I was in control of the situation. At this point it’s very difficult for the hecklers to play power games with me (i.e. heckle) when they both know me, like me and have no need to force their way into the show when I’ve already included them. In the end the two hecklers sat back looking content and laughed their way through my set. The lesson is: Don’t think that hecklers always have to be dealt with from the stage, if you get the opportunity, deal with them earlier off stage. It’s easier and more effective. On my recent maiden voyage on the enormous Royal Caribbean ‘Voyager of the Seas’ I was reminded of the importance of versatility for the professional comedian. I also paused to think about the difference between the comedian who spends years building their niche vs the comedian who works more commercially. 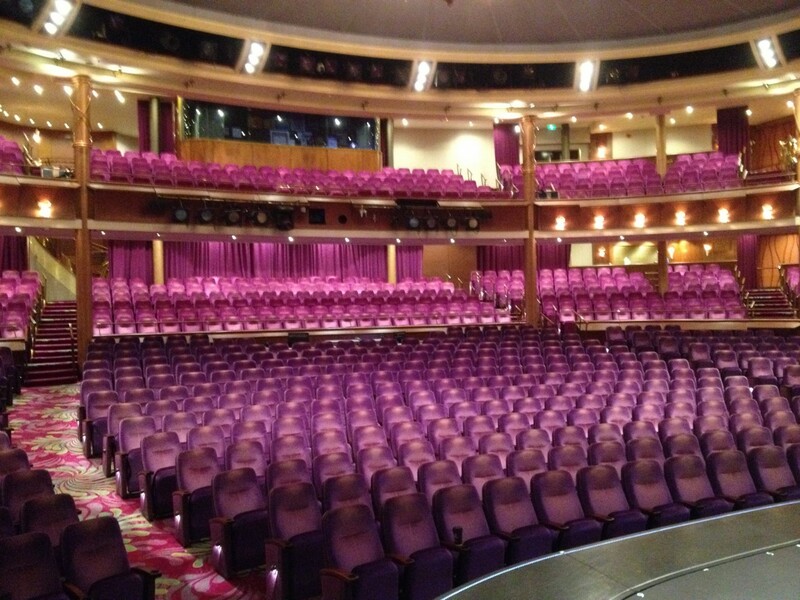 In a 2 week period I performed 4 Children’s Shows, a 5 minute Family Friendly Welcome Aboard Show and 6 Adults Only Comedy Shows in the Comedy Club on one ship and then performed a 35 minute Family Friendly Welcome Aboard Show and a 45 minute Adults Only Show in the main theatre on another ship. This required lots of preparation to ensure the right material and appropriate style was delivered for each show. I also needed to be ready for eventualities. As it turns out I was meant to perform a 15-20 minute Welcome Aboard set but due to other performers being unavailable I was asked to carry the whole show by myself and perform an extended 35 minute set. Preparation is everything and luckily I had the material at the ready. I keep hearing over and over that corporate stand up comedy gigs can ‘destroy your soul’ as an artist. This is perfectly understandable given the difference between a club gig and a corporate gig. I find that I never stop learning ways to improve my corporate stand up odds for success. Let’s look at the differences between the two environments. At a club you are most likely working in a controlled environment that is designed for comedy. The logistics are well thought out, from the sound, lighting and stage height, size and position. The crowd has also come to see you in particular or comedy in general. The crowd is also more educated in comedy and many are regulars meaning they are more likely to understand your material and accept and appreciate your persona. The venue staff should also know how to operate in this environment priming the audience for a great night through good quality, efficient, and at times subtle, table service. All of these factors make for a great night. Contrast this to a corporate event where the environment may be out of your control. The logistics of the sound, lighting, stage, room layout and schedule may all run counter to a great night. There may also be political rivalries in the room where business colleagues or competitors may have created tensions with each other. Suddenly you enter the stage hoping for success in what may be a totally foreign environment for you. How do you raise the odds of success? My tip is to try to resolve as many issues as possible by making as many demands as you can immediately after you have been booked for the gig. Chances are you will have an agent to negotiate for you. If so, give the agent your wish list. It’s a document that lists everything you would like in a perfect world. Acknowledge that it may not all be possible but if you have a few that are deal breakers, let your agent or the direct client know. The earlier you get your list in the more chance you have of getting what you need. Don’t expect to get the full list if you only ask on the night. • I would like a stage that is higher than the audience by at least 30cms. • Please provide me with a hand held radio mic tuned so that I can walk into the audience without fear of feedback. • I would like to have the room lights dimmed just before my introduction. This will help focus the crowd. • I would like a straight mic stand placed in the centre/front and a high stool (or a small card table) to the side. • I perform with a glass/bottle of water on the stool/card table. • Please have the host introduce me using the supplied introduction. Also please read the preamble, regarding turning off mobile phones and turning chairs to the front, prior to the main introduction. • I recommend placing my performance after the main course and before desserts. Please ensure I perform before dancing begins. 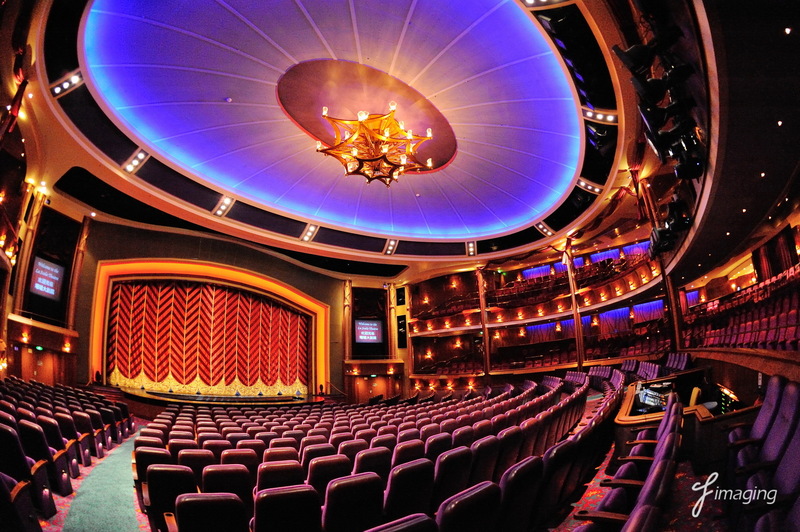 • If I am following a long segment, for example an awards ceremony, please consider giving the audience a short refreshment/restroom break prior to my performance. • Please ensure there is no table service during my performance. Although the list may seem very long, if I was producing my own show, it would be even longer! By the way, be careful though not to scare the client, especially if they are new to running events. Make it clear that this list is designed to make your set, and therefore their night, more successful. You are trying to connect with your audience and this list will help enormously. Remember to be flexible though; if you don’t get some of your wishes, decide if they are deal breakers or not. If you can negotiate on some of the stand up comedy checklist then well done! If you are very unhappy, don’t do the gig. There are 2 main impediments to having a successful corporate stand up comedy gig. In my next blog I’ll share these with you, give you the solutions and give you some great tips along the way. Today I’ll be performing for the youngest audience ever in my career at the Melbourne Comedy Festival 2014. I’m even bringing my own kids. I’ve decided to roll out an excerpt from my cruise ship family show. With 10mins required I’ll perform ‘Rindercella’. It’s an old Ronnie Barker routine that comics everywhere have adapted with their own jokes. Full of spoonerisms, the dirty jokes are hidden from the kids who aren’t old enough to reverse the spoonerism. It’s like a secret code! I make out that it’s a story for the kids but the adults soon work out what’s going on. Occasionally there’ll be a fart smella… I mean a smart fella amongst the kids who’ll laugh along. We’ll see! Show: ‘HUGGERS’ – Exford Hotel, corner Russell & Little Bourke Sts CBD, Melbourne 12pm. 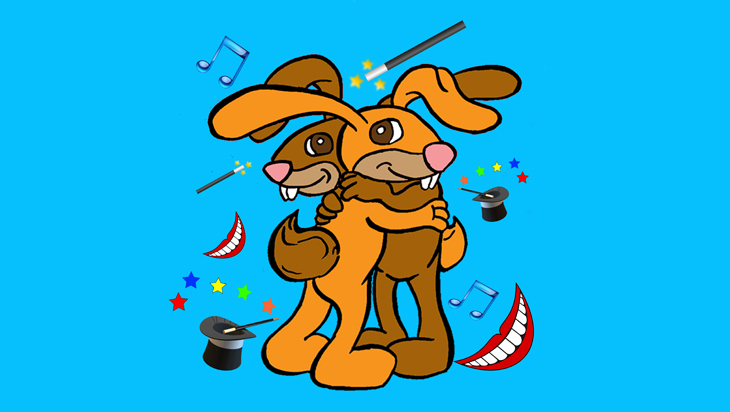 Huggers Show – What a cute logo! Then later today at 6pm I’ll jump back up in the Comedy Festival with the ‘Who’s Your Daddy’ show at The Joint at 6pm. Last night was loads of fin working with Terry North and JJ McLean. It’s straight Stand Up Comedy telling stories about being a dad. A topic I know pretty well by now! Dropping in for a 15min spot makes a nice change of gear from having worked so regularly as a corporate Master of Ceremonies over the last month. Show: ‘Who’s Your Daddy’ – The Joint, corner Flinders Lane & Elizabeth St CBD, Melbourne 6pm. 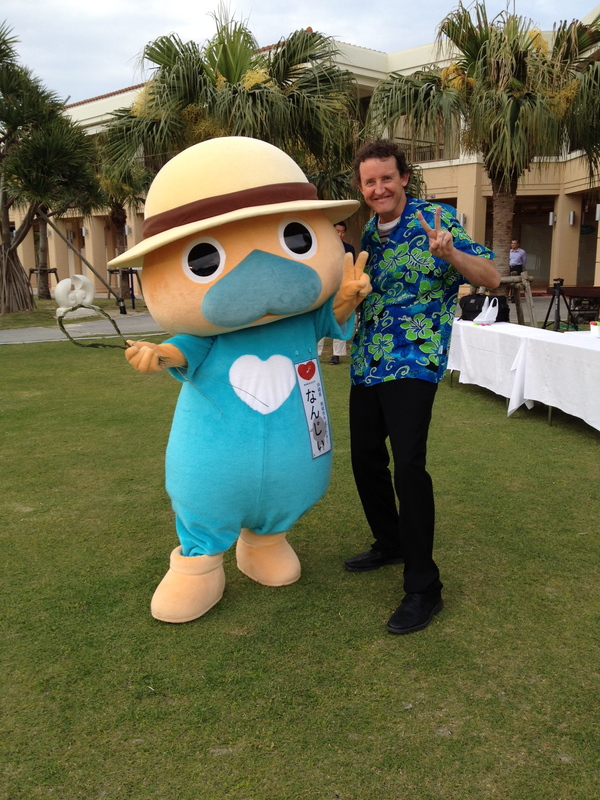 I’m just back from working as Master of Ceremonies at a huge 4 day conference in tropical Okinawa, Japan. Wow what a place! 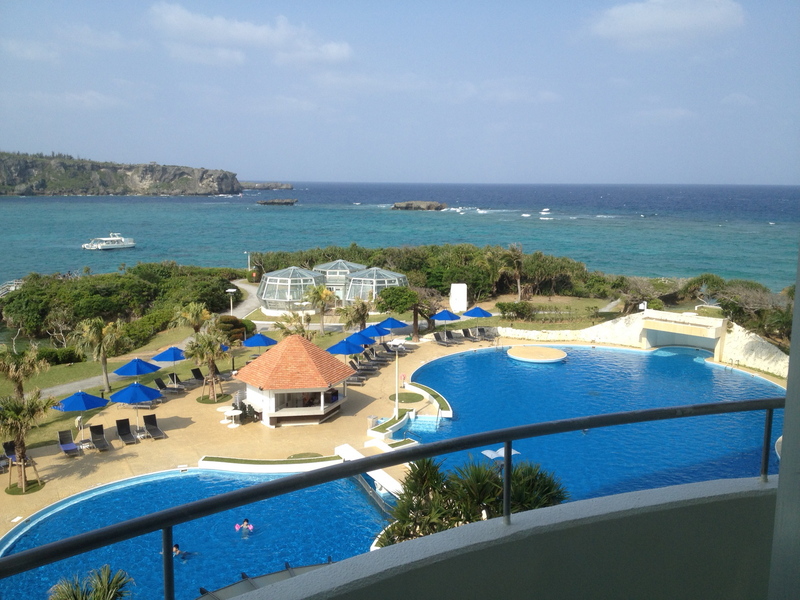 The conference was held at the Manza Intercontinental Resort which is a sight to behold. The resort had its own enormous beach, perfect for the beach team building games for the 220 guests. My role was to keep the event running smoothly working with the expert team from Spinergy Singapore. I hosted the welcome event, gala dinner and closing night dance spectacular as well as running group briefings and creating energisers along the way. 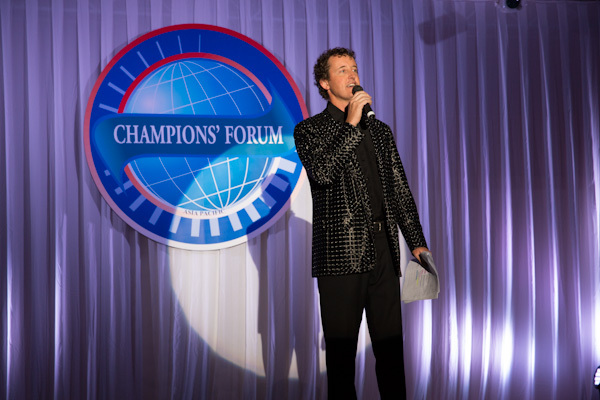 The Gala Dinner Awards, particularly, is always a pleasure and a challenge, especially when it comes to pronouncing 220 Asian names from 14 different countries! I take the task very seriously and spend at least a week getting it right including recording and learning each name over and over. I believe it makes a huge difference to understand the difference between the Korean pronunciation of for example: ‘Lee’ and the Mandarin version. The moment when a 1st time winner enters the stage as the best employee out of 5000 candidates is very special. Hearing their name spoken perfectly by a foreign MC adds to the moment. My wife Sharni and I are proud to announce a new addition to our family – Tarquin Marlo Cameron born 18th Jan 2014. He’s a very healthy little boy weighing in at 4.72 kg (10.4lb)! So it’s fair to say that life has changed quickly around here already. Felix and Sadie are very excited to have a little baby brother and are constantly fascinated by everything from the bathing ritual to the vibrating baby bouncer. The bad news is that after a break of 1 year we’re back in to nappies again and all parents with multiple children know how much that hurts!! With more mouths to feed I need to bring on the gigs! Luckily there’s lots going on. I’ll be back on the Carnival Spirit cruise ship at the end of February and also at the end of March. I should have many more stories for the crowd by then. As far as Corporate MCing goes, I’m off to Okinawa, Japan in April followed by Prague, Czech Republic in May. Both are conferences for Citibank South East Asia. The Melbourne International Comedy Festival hits somewhere in the middle and while not performing a show I will be jumping up on stage in a few select rooms. I also have my new comedy keynote presentation called ‘Brainstuff’ which I’m looking forward to performing around the country this year. Wow, what a city! My MC duties are now over and I can relax. No more corporate speak. This place is truly amazing. Why doesn’t it get mentioned in the same breath with ‘New York City’ or ‘Paris’? Laneways everywhere oozing with style. Poverty brings desperation but it also brings clever street salesmen, stunning cheap crafts and crazy traffic where pedestrians jostle with taxis trucks and the ‘recycling guy’ dragging his vastly over-stacked trolley. Extraordinary mosques on every hill, The Bospherous a magnificent waterway filled with everything from small tourist boats, regular commuter ferries, large car ferries through to huge tankers crossing the 3 seas to the Black Sea. 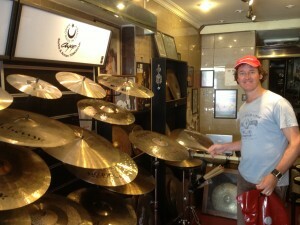 Being a drummer I was pretty distracted by the famous Turkish cymbal manufacturers. The cymbals looked and sounded amazing. I couldn’t believe how many music shops there were in the same street. I counted at least 10!